Our customer was performing cyclic, nonlinear, 3D finite element analysis of a hose. For this purpose he needed a material model. The hose was made of an elastomer reinforced with some layers of continuous fiber. We first sketched a test matrix. Then we developed specimens and prepared them from the hose. 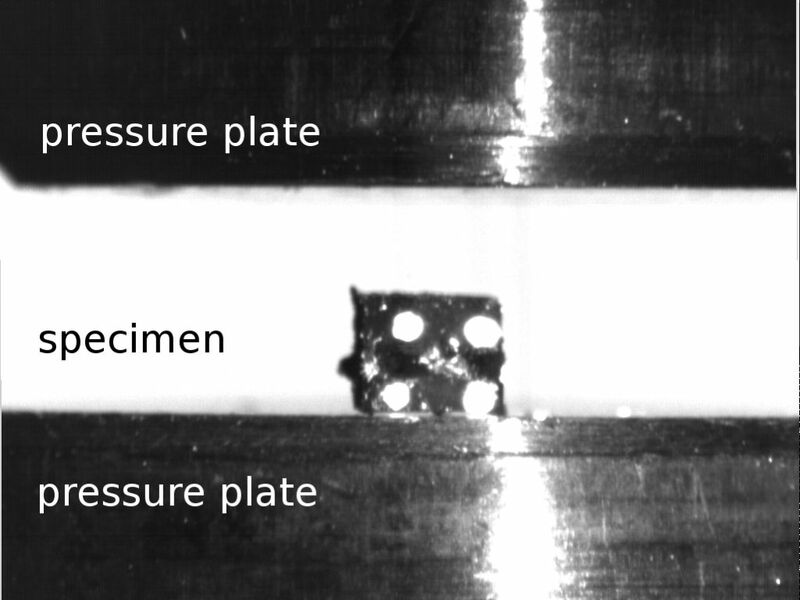 We used tensile specimens and compression specimens for characterizing the elastomer base material. For testing the composite, we directly used a piece of hose. As the hose wall thickness was small, we needed to prepare tiny compression specimens. These small cubes had a side length of little more than a millimeter. Nevertheless we managed to put strain marks for video extensometry. Using a custom compression test setup we performed cyclic compression tests. Equivalent tests were performed for tension. The red curve in the graph shows a cyclic tensile test result. It can be seen, that hyper-elasticity and Mullins damage were the most important aspects of material behavior. Also, we observed some viscosity and a little bit of permanent set. We then selected an Abaqus material model. 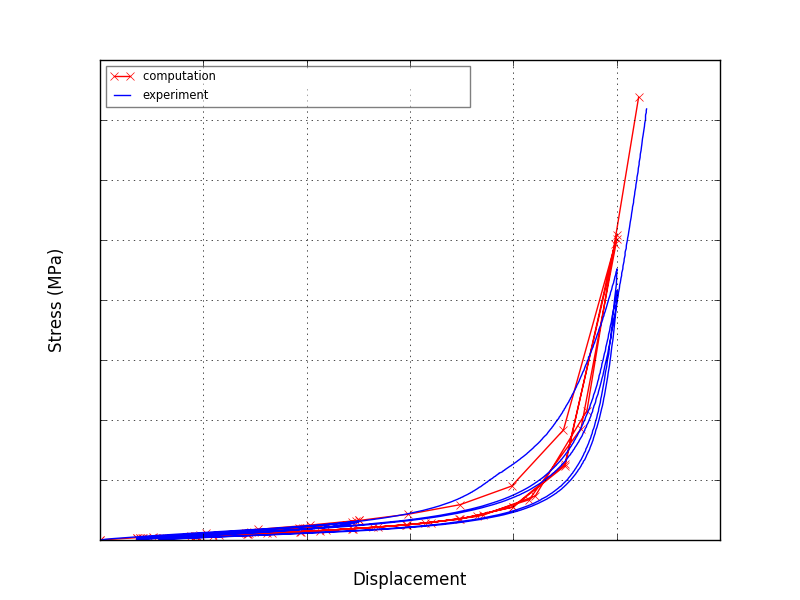 In order to keep things simple, we chose a hyper-elastic function and combined it with Mullins damage. 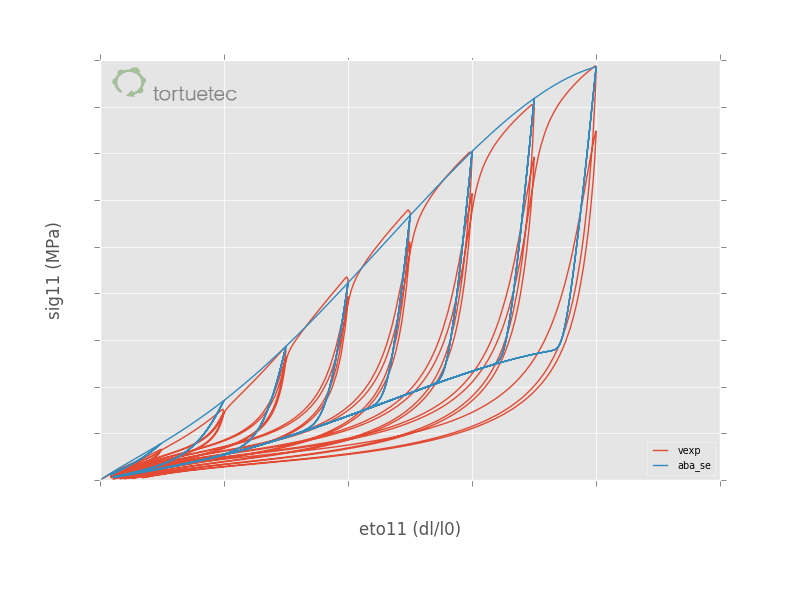 In the figure, the blue curve shows the simulation result after model parameter calibration. Then we performed cyclic tensile tests with the hose composite (blue curve). And we analyzed the hose’s fiber layup. This included the elastic fiber properties, fiber volume fraction and lay-up angles. To this purpose we used quantitative analysis of digital micro-graphs. 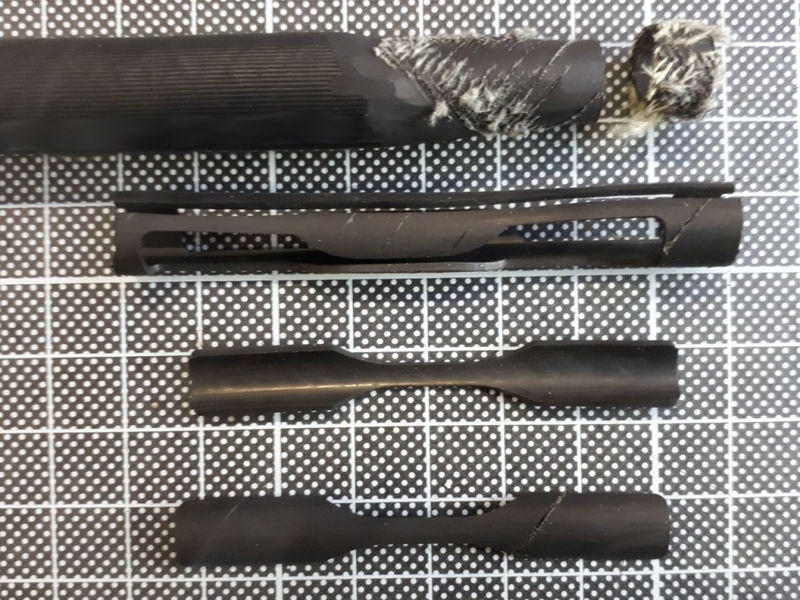 As an composite FE model we then used 3D elements for the elastomer and embedded rebar elements for the reinforcement. For the rebar model parameters we applied the microscopy results mentioned before. The red curve shows the simulation results using the final composite model.